Embroidery is a huge trend this season and is on everything from jeans and dresses to tops and bags. It’s a style detail I’ve always loved; it fits with my fondness for all things pretty and feminine. 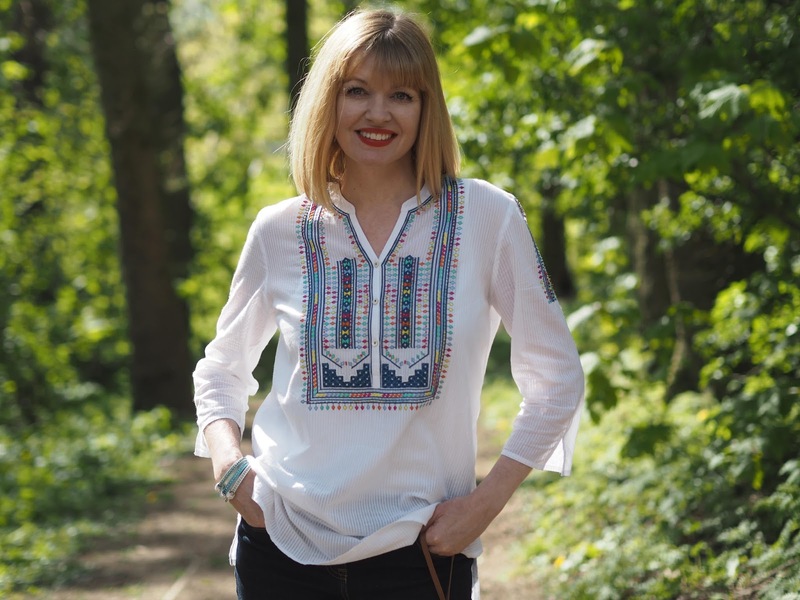 Often, embroidery takes the form of flora or fauna, with flowers, leaves, bees and butterflies featuring within the design and I have a few new pieces which I’ll share in due course, but this top with multi-coloured embroidery is a little bit different. The embroidery is in a geometric design in bright, clear colours. It”s a top that shouts “summer” but is begging to be worn right now. Despite the sunshine, it’s still a little chilly so I added a white vest underneath and teamed it with skinny jeans and a scarf so that I could do just that. 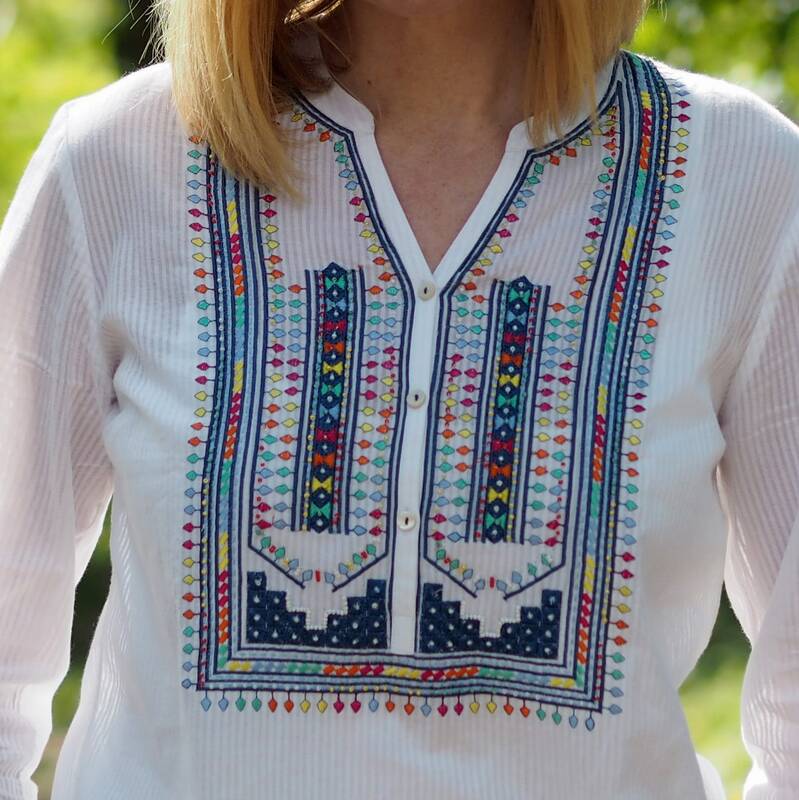 It’s from East, a brand which, as the name suggests, is inspired by eastern clothing and which is evident in the shape and cut of this top; the tunic shape, notch neckline and side slit are reminiscent of an Indian kurti. It’s beautifully made in cool, crisp cotton so it’ll be perfect on hot(ter) days teamed with denim shorts and flat sandals. I think it would also look stunning over a bikini as a beach cover-up too. 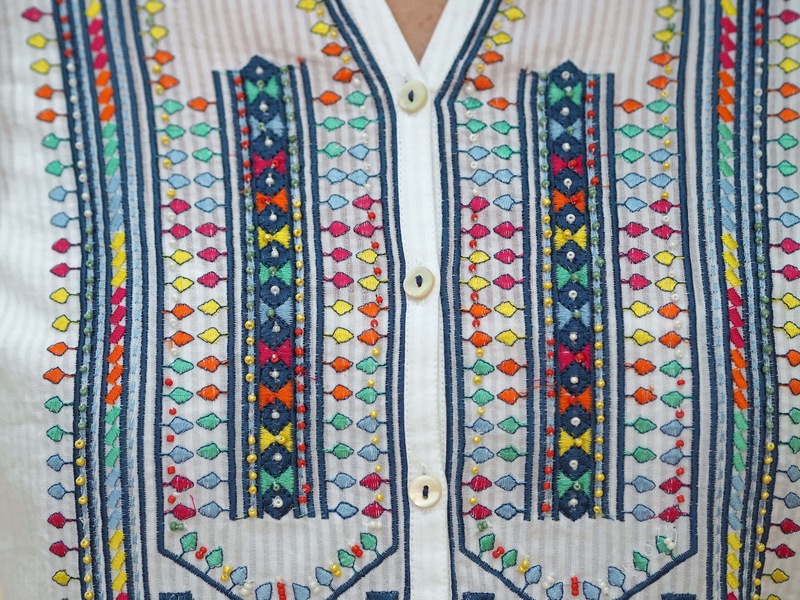 In fact, it’s a very versatile top because it could be worn with linen trousers too. 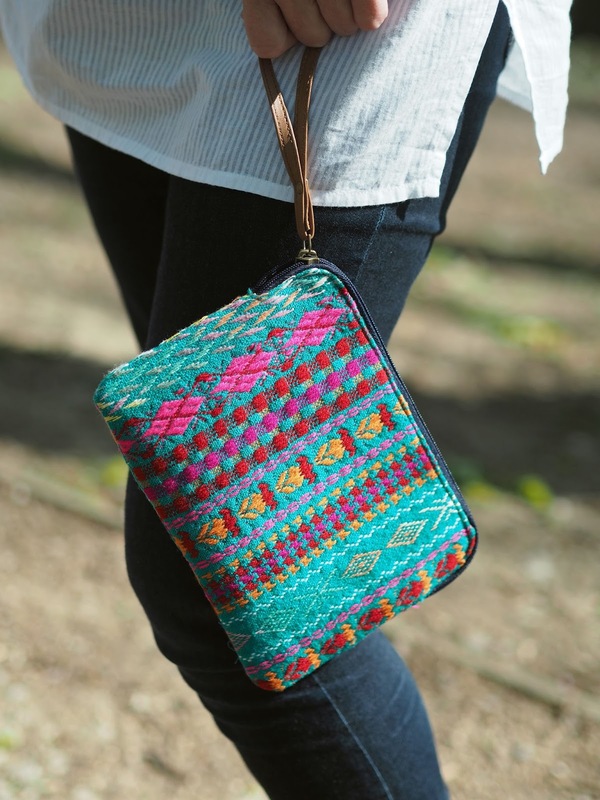 This Aztec inspired clutch is a riot of colour and texture. The wrist strap makes it a little more practical than clutches and pouches that don’t and it is large enough to fit an Ipad mini. It’s exactly the type of multi-purpose bag that I like and envisage it holding my passports and plane tickets later in the year. My sparkly wrap bracelets are from my own range at Lizzy O. They come in a variety of colours, both brights and neutrals and are fabulous when stacked together. because they’re lightweight too, they are very comfortable in warmer weather and add a flash of sparkle. Sign up to my monthly newsletter here for exclusive subscriber discounts at Lizzy O. I send it out on the first of the month and always include a code which ca be used across the site. 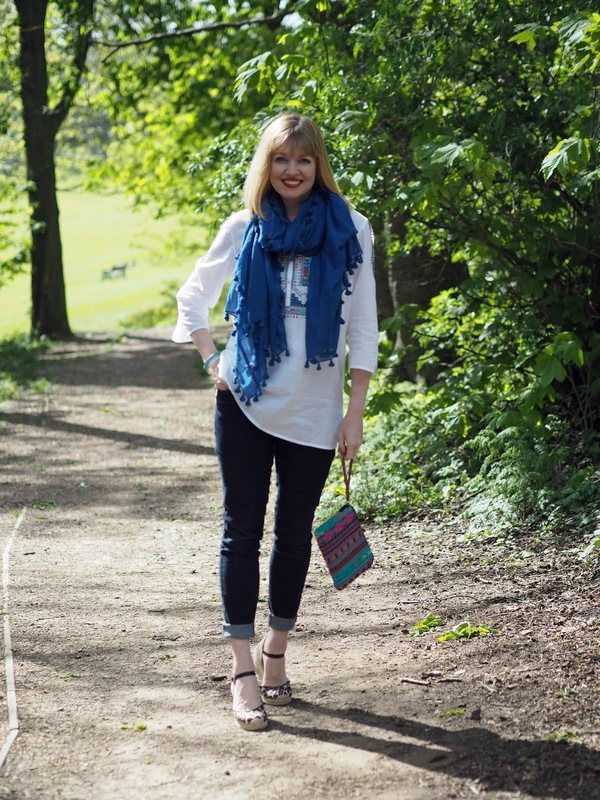 A scarf is an excellent way of adding a pop of colour to an outfit but is also a very useful extra layer which can be added, removed and folded away easily. I always travel with one. They can be put around the shoulders on cool evenings, around the neck on cool days and actually, perhaps counter-intuitively, worn across the chest to keep cool and protect the delicate skin from sun damage. 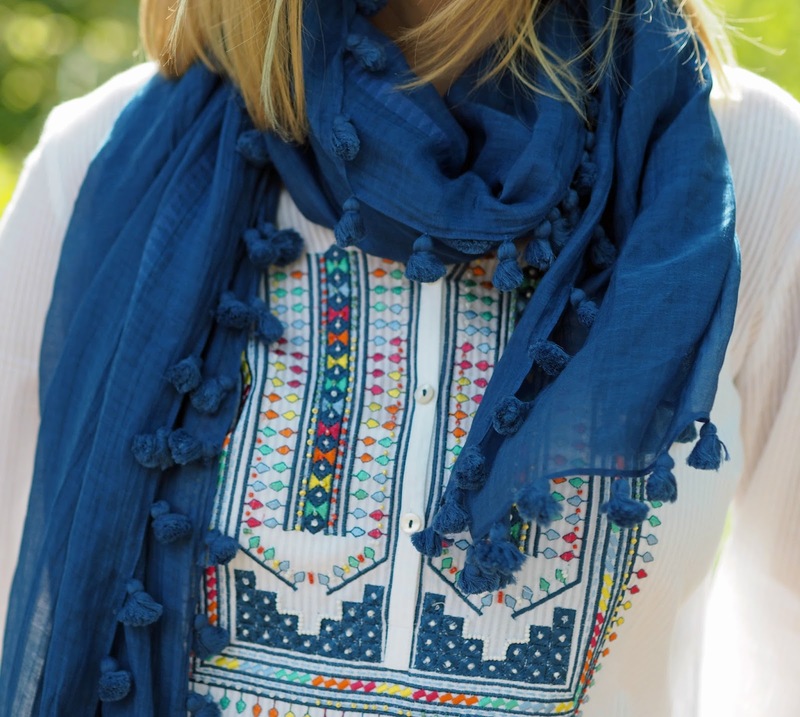 This pom pom scarf in the most delicious shade of blue is a silk cotton blend and is softness itself. 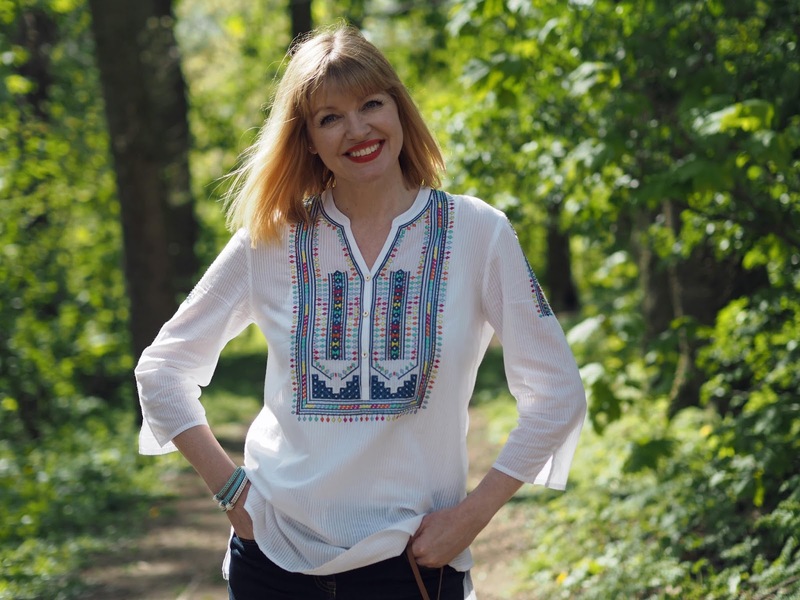 My lovely blogging friend Michelle, RetroChicMama has also been very impressed by East this season and features an outfit in her absolutely gorgeous post titled, “How To Do The Basket Trend Everyday” so do go and take a look. Skinny jeans, Next, past season. *These items were gifted and this post was sponsored by East. My opinions are always 100% honest and the content is always my own. Thank you for supporting those brands that support What Lizzy Loves. Previous Post The Perfect Dress For Spring Summer Weddings, A Day At The Races and Special Occasions. I love your blouse, it's beautiful. I like that romantic air and look boho. The bag is cute. Very striking embroidery, a refreshing change from the usual flowers and bees (though I love them too). Nicely styled with the Aztec bag. 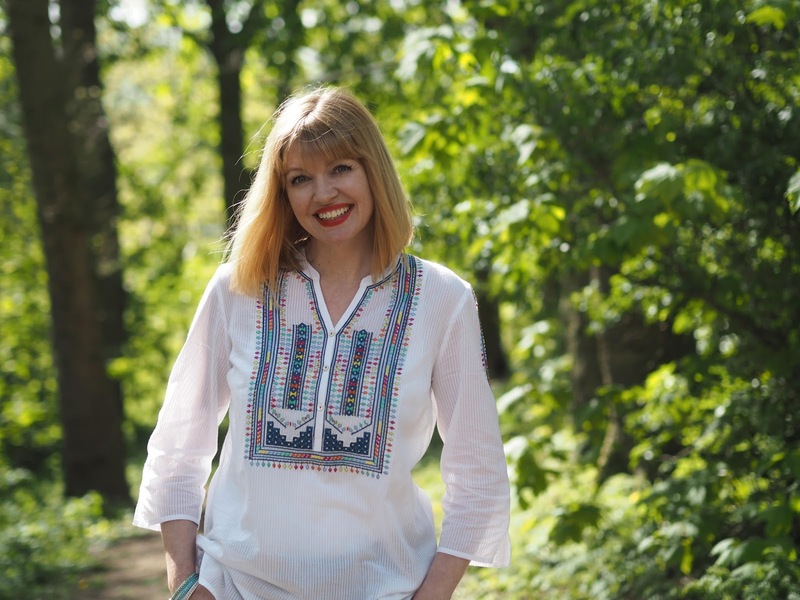 I am still wearing warm clothes because of our dreadful weather and almost forgot how warm temperatures and light clothes make me feel… Your blouse and matching clutch are lovely and I am sure they will be perfect for your beach holidays! Super outfit Liz, your styling with the scarf is brilliant. 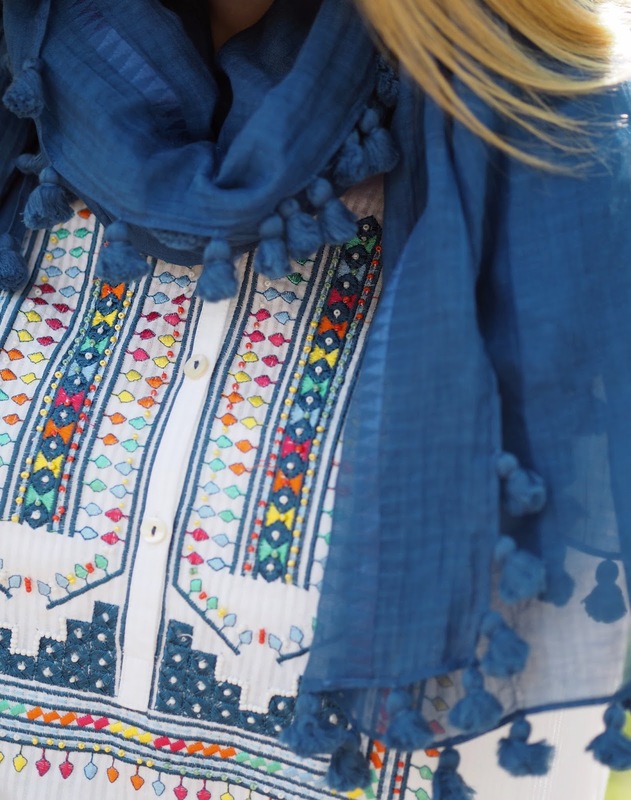 I often need an extra light layer for those chilly spring days but don't fancy a jacket, this is warm yet with a lightweight touch & doesn't cover that funky aztec embroiderie. 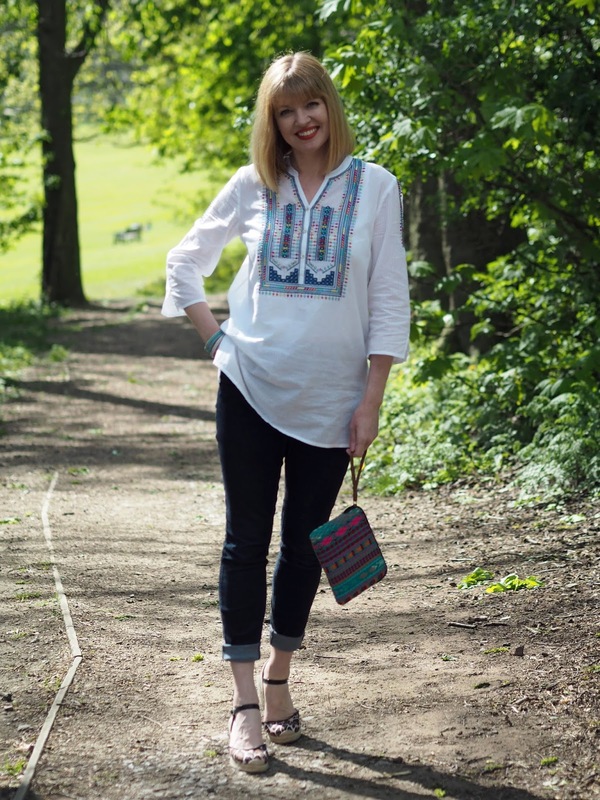 Absolutely love your embroidered top! This is one of those pieces that you can wear all summer long. Really pretty! Do I have to be signed up for instance stories you see yourself? I wanticipate to see it but don't know how!